A couple of months ago we won a “health food basket” through a local giveaway and in it came a huge bag of wheat germ. This isn’t an ingredient we normally use, so after sitting in the refrigerator for awhile I decided to find a way to use it up. 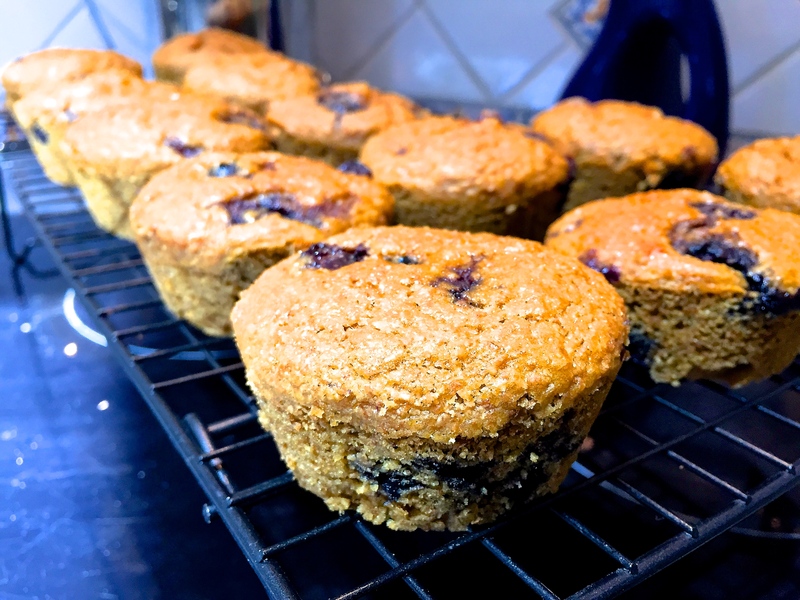 Other than adding it to smoothies, I’ve worked it into a few recipes, including this one for muffins! These were delicious! 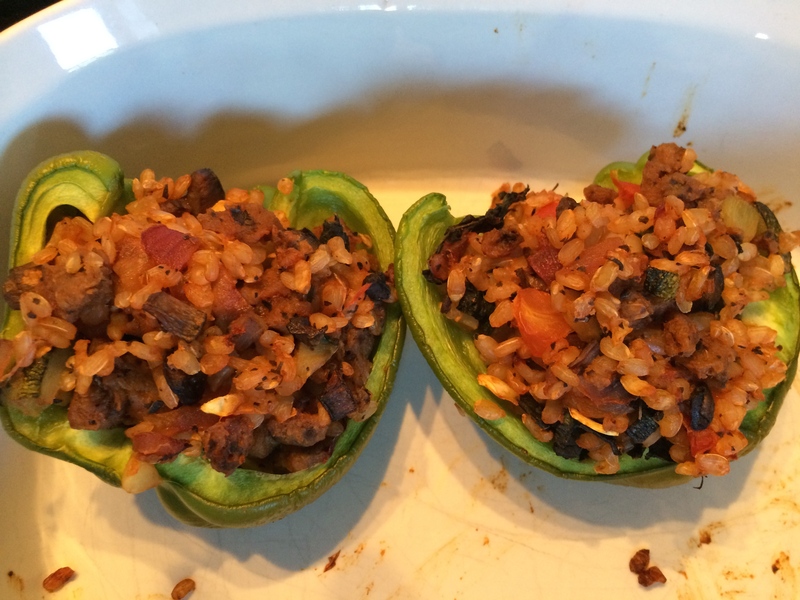 They held up well and their packed with healthy ingredients. Mix almond milk and ACV together and set aside. Mix together all dry ingredients in a separate bowl, then add in milk mixture, molasses, oil, applesauce, and vanilla. Mix well and then add in blueberries, stirring until distributed throughout. 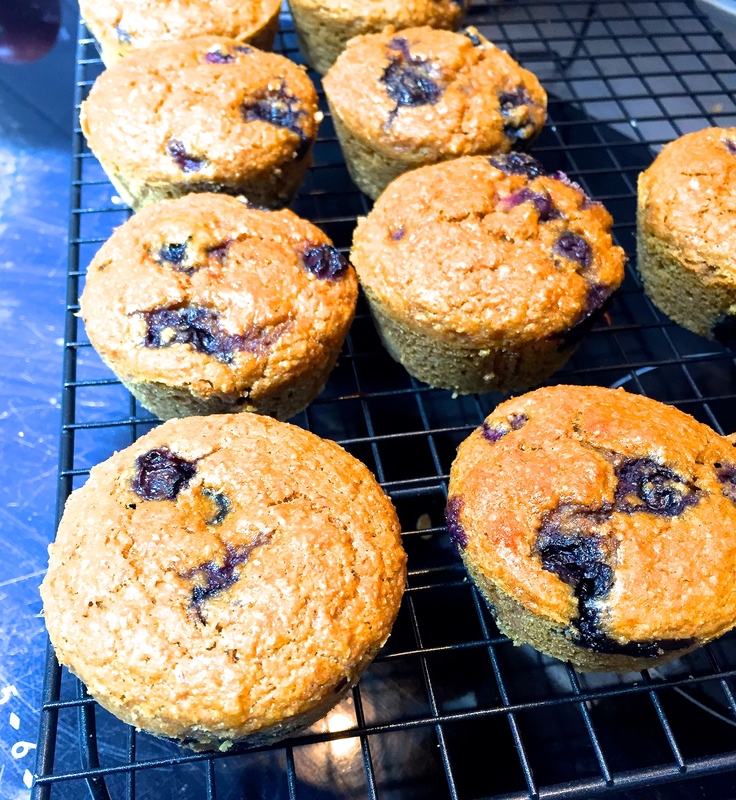 Spray muffin pan and then pour in batter, filling each well most of the way. Bake for about 28-30 minutes. 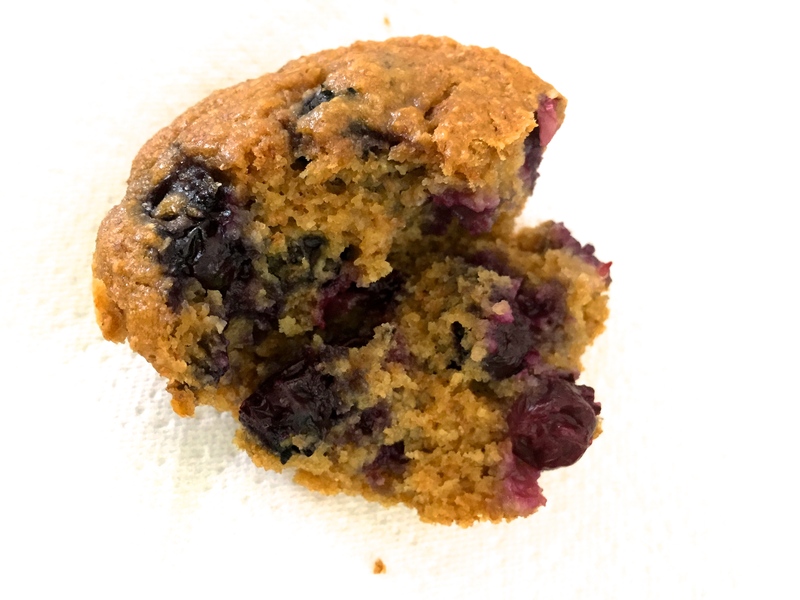 You can test if their done by inserting a toothpick and seeing if it comes out clean, though keep in mind the blueberries will be wet. The dough should not be. 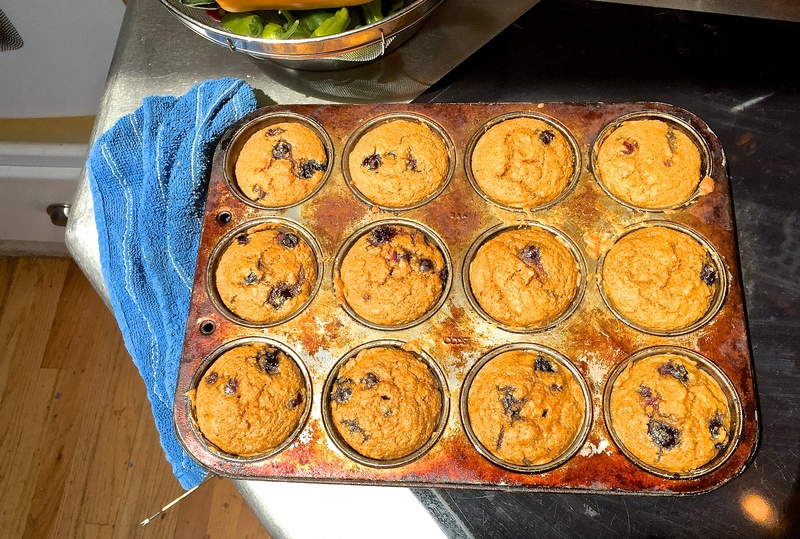 Remove from oven and let cool for about 10 minutes before removing from muffin tin. Th finished product! Store in a airtight container (they are best warm!). Enjoy! 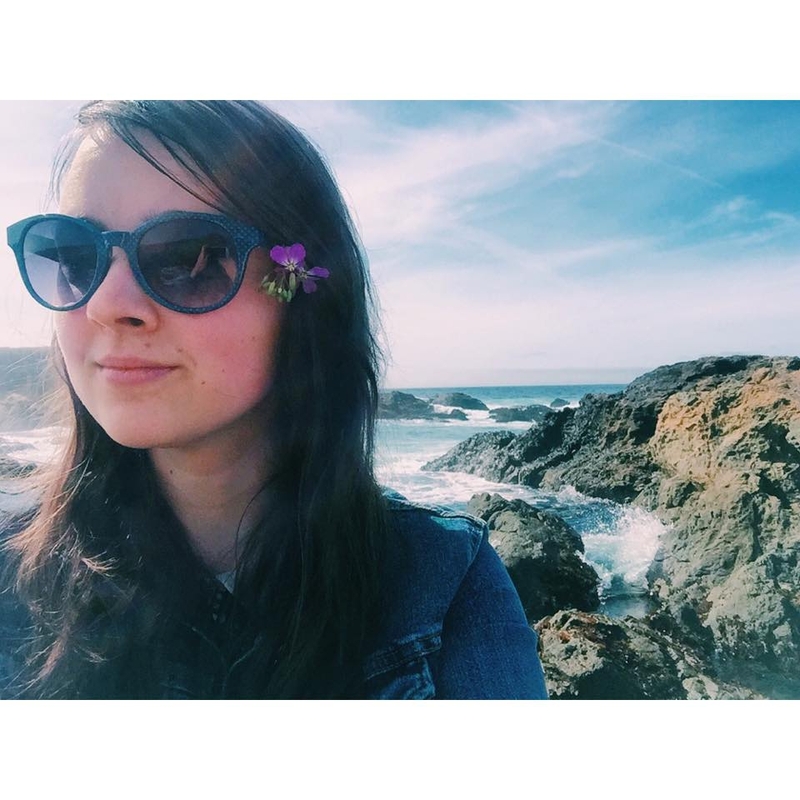 This entry was posted in Recipes and tagged Baking, plant based, Recipes. 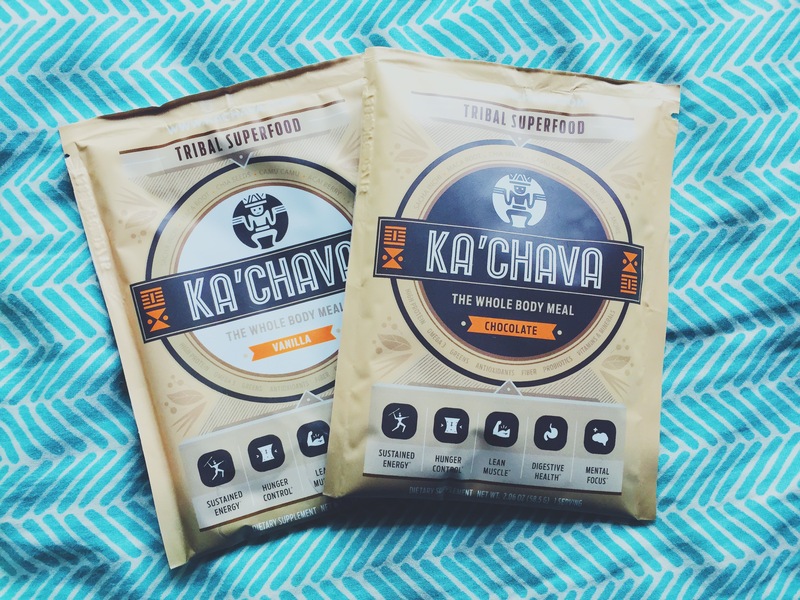 Recently Ka’Chava sent me some free samples to review of their Tribal Superfood Plant Based Whole Meal Powder. It’s Vegan, Gluten free, Soy Free and has zero preservatives. It boasts 24 grams of protein, 9 grams of Fiber, Omegas, Antioxidants, Probiotics, Super Greens, Adaptogens, Vitamins and Minerals. And it tastes great to boot! 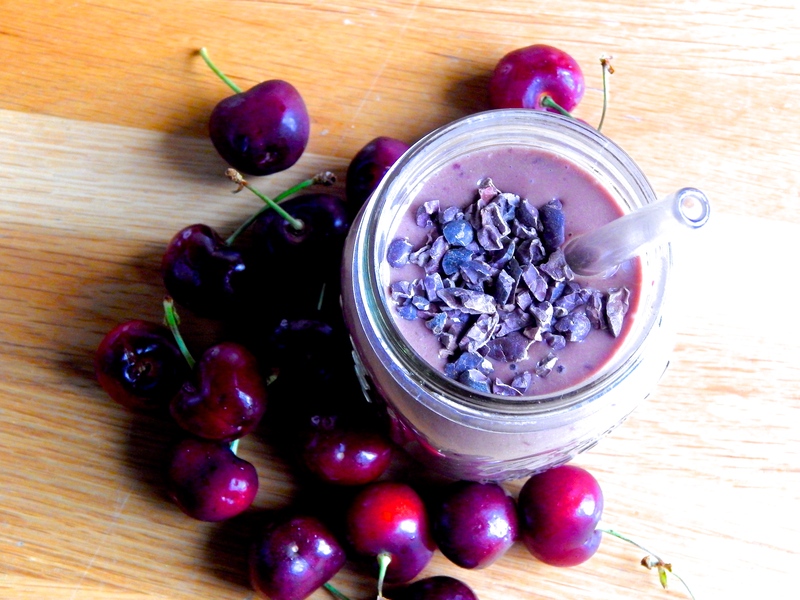 I’ve tried several plant protein powders and many seem grainy or bland or gritty. 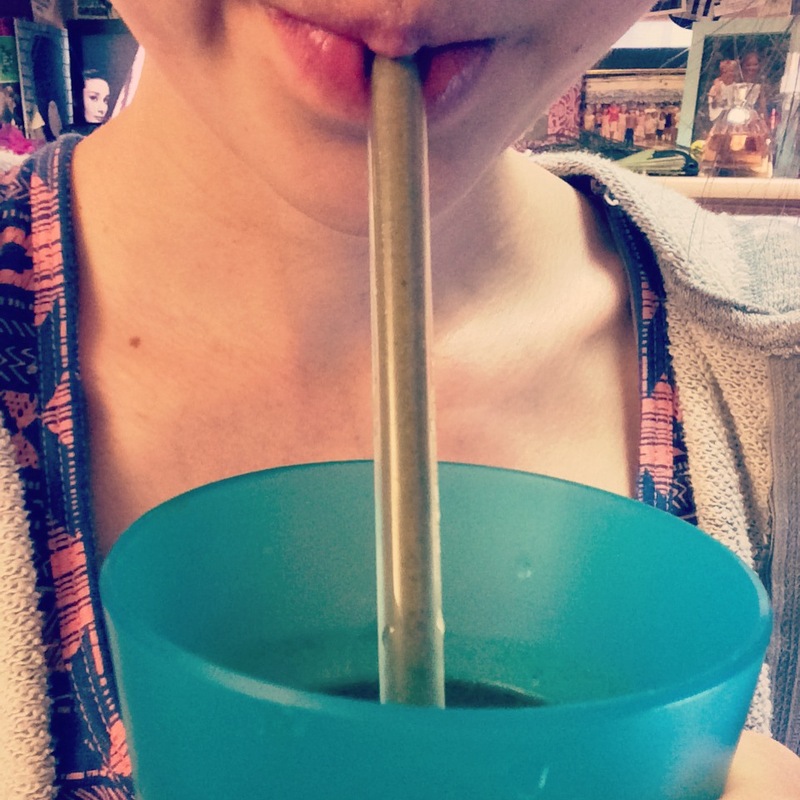 Ka’Chava blends smoothly and tastes great! It also contains a good variety of nutrients to get you through your day. Perfect for busy mornings where you need a grab and go breakfast that will actually keep you sustained. 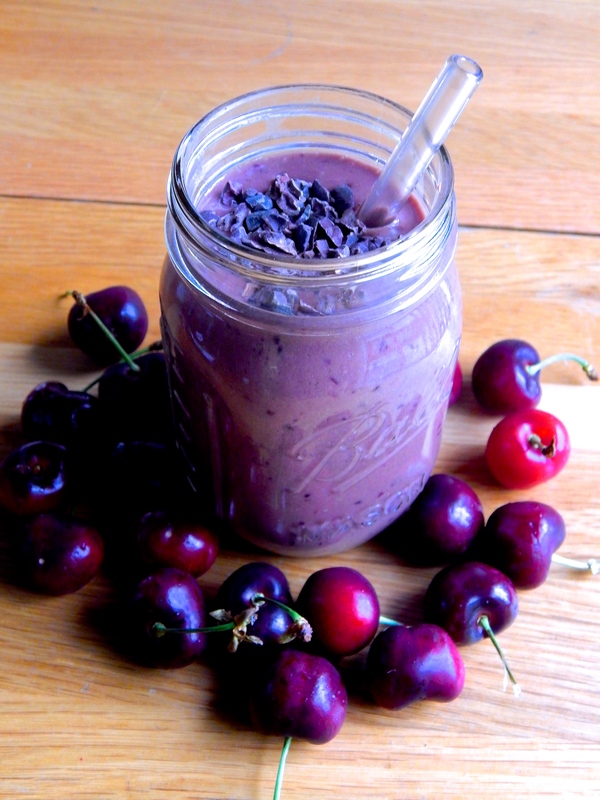 This week Whole Foods Santa Cruz has cherries for a great price so I decided to incorporate them into a smoothie. I definitely recommend picking some up for this weekend. A great Memorial Weekend treat. This was delicious! Blend! It was cold and sweet and perfect for my sweet tooth. The Ka’Chava helps make the smoothie thick and filling. Last week I managed to pull a muscle somehow and I’ve been in some pain whenever I walk. I’ve been resting a lot and on the doctor’s recommendation I took some pain medication which has definitely helped. Hopefully I’ll be back to 100% soon so I can be active again. Looking forward to the long weekend. (no classes Monday)! Hopefully I will be doing something fun! 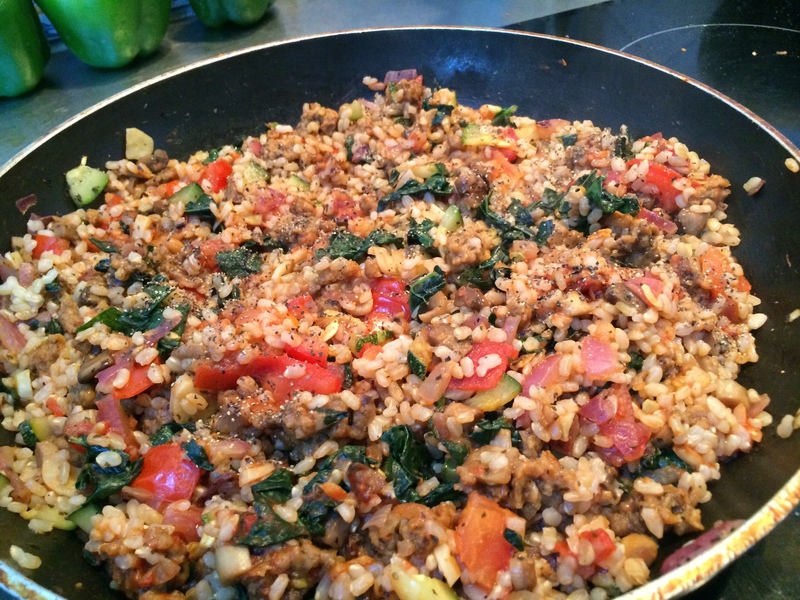 This entry was posted in Recipes and tagged product review, recipe, reviews. If there’s one dish my mom loves to make it’s blueberry buckle. 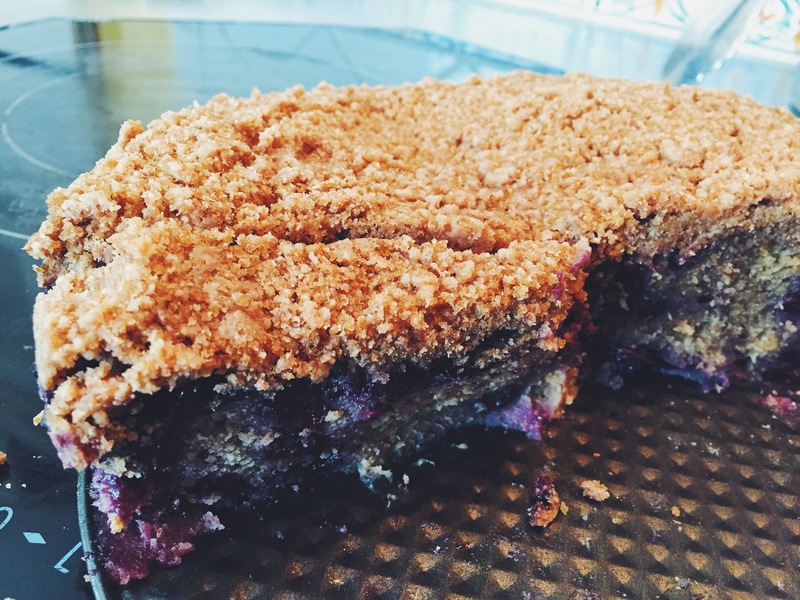 A cake like breakfast dish packed with berries and topped with a delicious streusel topping. I remember many weekend mornings walking into the kitchen sleepy-eyed and seeing her busy at work surrounded by flour, sugars and mixing bowls. It’s the dish a friend would receive in a time of need, a dish we would take to my grandma’s with hot coffee in hand. And it’s very not-vegan. Butter, milk, egg. All play a hand in it’s creation. Over this Christmas break my parents have been eating and cooking vegan meals with me a most every night. We had a vegan Christmas Eve and a vegan Christmas. They really enjoyed all the dishes we made and were enthusiastic to cook their own. (The Isa Does it cookbook has been our go-to). We’re now in the post-holidays stretch and I’ll be heading back to school on Sunday. (boo) We’ve been trying to make all the dishes we wanted to try before I leave and trust me there are plenty. So many great vegan recipes and blogs out there! So when my mom asked me last night: “Hey do you think we could veganize the blueberry buckle recipe?” I was game. I’ve gotten a lot better at learning how to successfully adapt recipes and make them vegan. We switched out the butter for solid coconut oil, the egg for a flax egg, and the milk for almond milk. It turned out so good! Just like the original. 1) In a medium bowl combine flour, sugar, cinnamon, and salt. Using a pastry blender or fork cut in oil until fine crumbs form. 2) Using hands squeeze together most of the mixture to form large clumps. The topping can be frozen in an airtight container for up to 6 months. 1) Preheat oven to 350 degrees. Use coconut oil to grease a springform pan and dust with flour. Mix flax with water and set aside. 2) In a large bowl cream coconut oil and sugar. Add flax egg and vanilla beat again. 3) In a second bowl mix flour, baking powder, salt. Add alternating almond milk with flour mixture into oil and sugar. Fold in blueberries. 4) Pour into a springform pan and then sprinkle with streusel topping. Bake 60-70 minutes until an inserted knife comes out clean. It may take longer to bake…don’t worry! It will take longer with thawed frozen berries than fresh. Enjoy a slice best when heated up! Good for breakfast or dessert. Enjoy with a cup of tea or coffee! This entry was posted in Recipes and tagged Baking, breakfast, Recipes. A couple weeks ago we received a bag of fancy Morrel mushrooms from a family friend who had gone mushroom hunting. These cost $38 a pound!!! Seriously. So we were lucky to get some for free to try. My mom, dad, and I all love mushrooms, but we usually stick to crimini, button, or portabello. Right away my dad wanted to make picatta! An old family favorite. 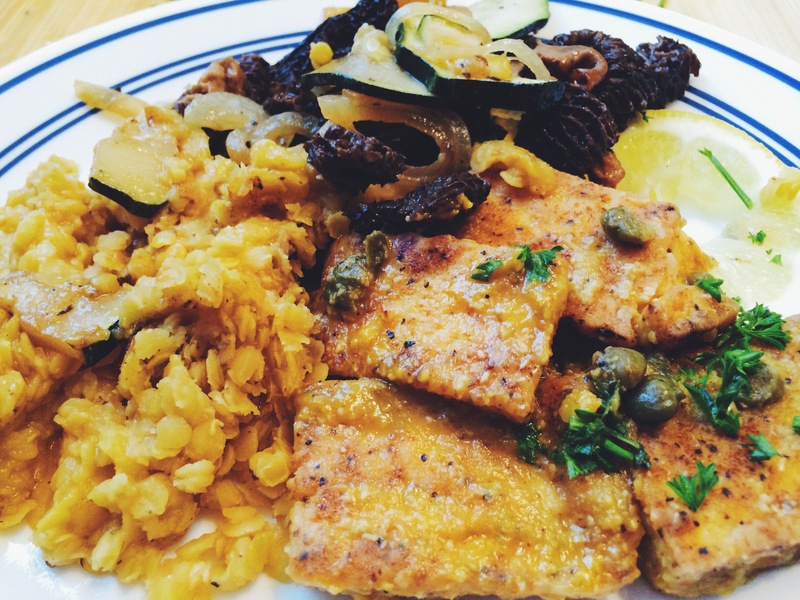 We had chicken picatta a lot growing up (I try not to dwell on the meat I ate growing up). But it was actually my dads idea to try to do a meat free version with extra firm tofu and that definitely made me happy. I love when my family is excited to try meat free meals! 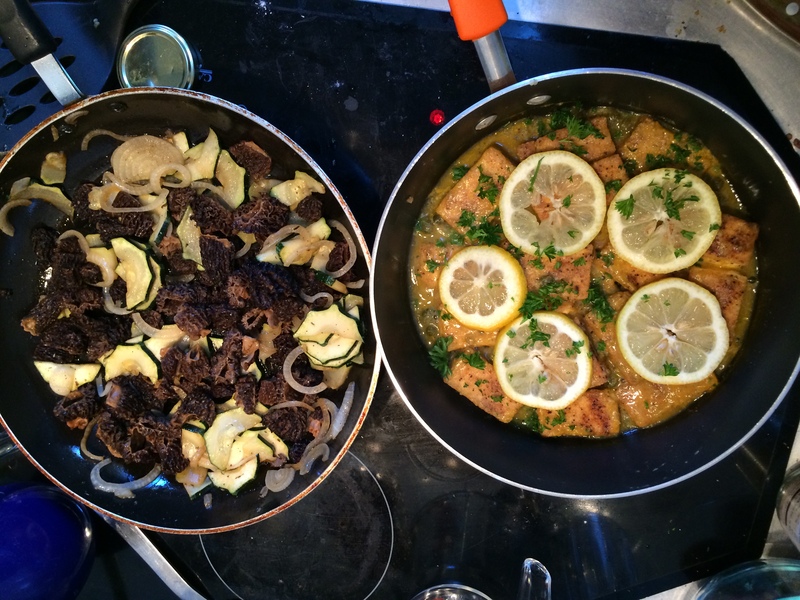 We served it up with lentils, and sautéed morels with zucchini and onion. It was so good! My dad even said he liked the tofu version better than the chicken 🙂 Veg for the win! Place flour, salt, and pepper on a plate. slice tofu and coat in mixture on both sides. Heat 1 tbsp EVOO in pan on medium high and once hot add the tofu slices. Cook until golden on both sides. About 6 minutes total. Remove tofu from pan and add in wine to pan. Add minced garlic. And simmer for 30 seconds. Then add in broth, lemon juice, capers, and heat for 1 minute. 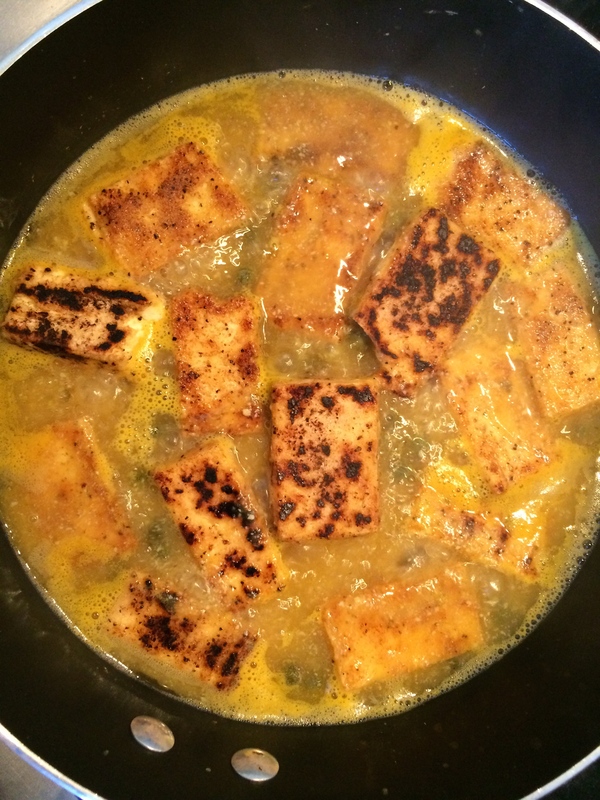 Add tofu slices back into pan so they can soak in the flavor. 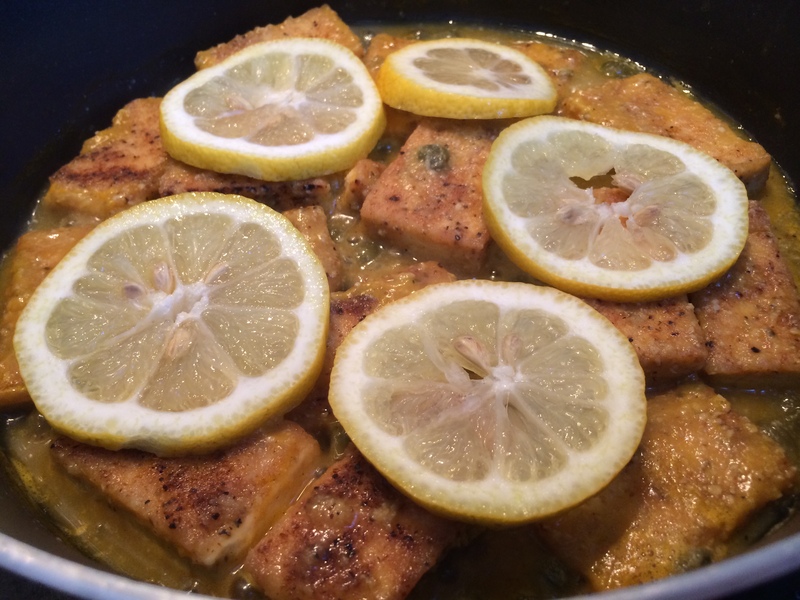 Add lemon slices onto top of cooking tofu. Remove from pan and serve garnished with parsley. 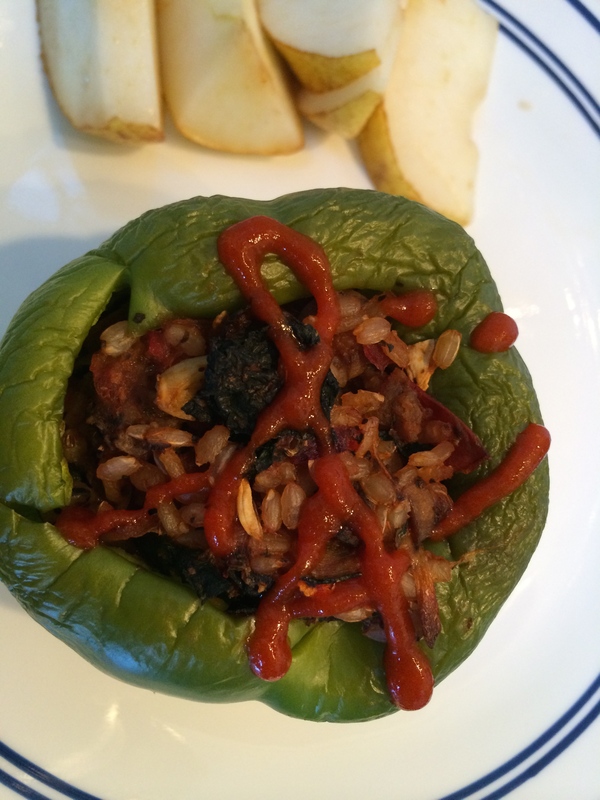 This entry was posted in Recipes and tagged plant based, recipe, Recipes. 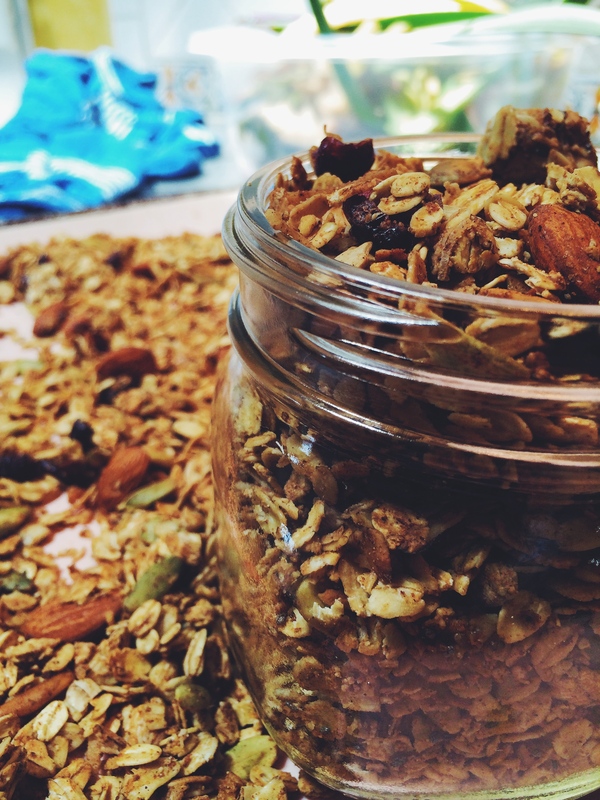 It’s really no secret I love making granola. It’s one of the few things you can really experiment with and in all likelihood it will turn out great in the end. We’re getting ready to embark on a long road trip Thursday so my snack preparation has already begun. I don’t want to run into any snags along the way, as any vegan or veg-friendly person knows it can be hard to find places to eat along the way. I’ll post a full break down of what we’re bringing closer to the trip, but for today here’s the granola I’ve prepped for the trip (I made extra because in all honesty one batch wouldn’t last all the way until Thursday in my house 🙂 ). 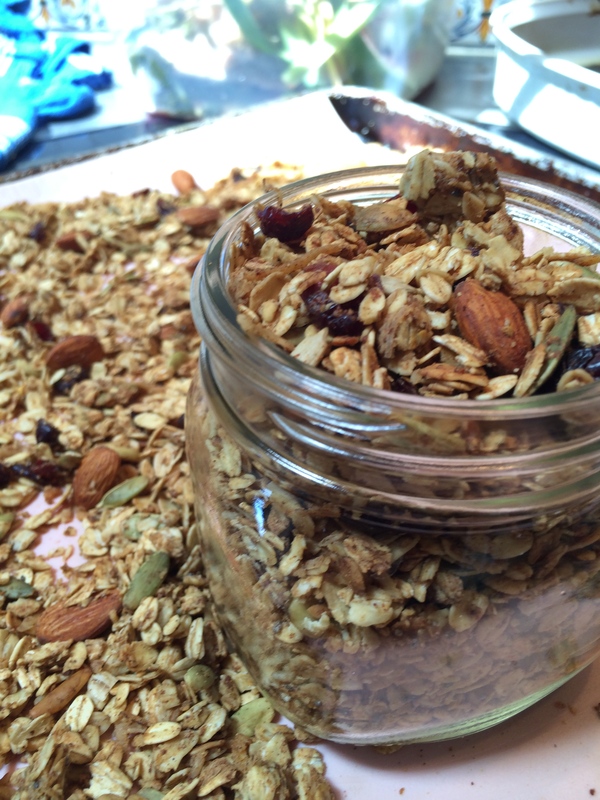 Combine all dry ingredients: oats, seeds, almonds, cranberries, coconut sugar, spices in a bowl. Add in peanut butter, oil, vanilla, and agave. Stir well until it’s mixed evenly. There will be some chunks from peanut butter I usually break up the larger ones and leave the smaller ones. Spread on silicone lined baking sheet (or you could use parchment paper. Silicone baking sheets are awesome and one of my favorite kitchen tools). Bake for about 10-15 minutes checking occasionally and stirring until golden and toasted. Remove from oven and let cool before transferring to an airtight container for storage. Family dinners have always been a tradition in our family. We always came home from school or work and ate at the table together. We hardly ever ate out and both my parents loved to cook (maybe thats where I get it from?). So it was really strange for me when I would go over to friends houses and they would eat in the living room in front of the TV or in their rooms. I quickly learned the importance of family dinners because I would listen to my friends talk about their families and realized how disconnected certain families were. Dinner was the time for us to all come home from a long day and talk about our experiences and laugh and tell jokes. We would cook together and clean up together before my brother and I rushed off to do our homework. I love that my parents created this structure in our lives and taught us the importance of spending time together. When I transitioned to a vegan diet I worried it would make these dinners difficult. You know, having to cook two separate meals or always cook something for myself, but it’s actually been relatively easy. We’ve always eaten pretty vegetable heavy meals and so it’s easy to switch out proteins or add in something separately to accommodate everyone’s desires. It’s also been fun expieremneting with meals that everyone likes and are totally vegan. 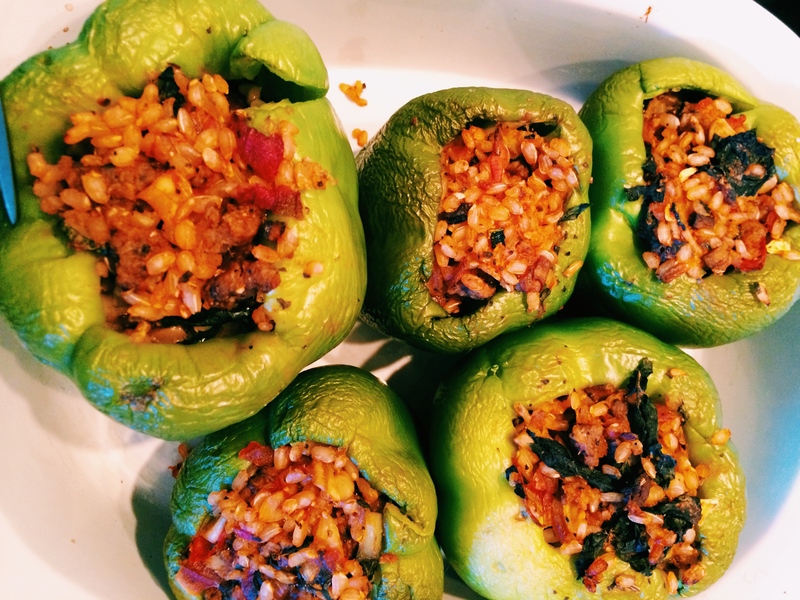 After snagging a bag of green bell peppers from the discount organic produce rack at a local co-op these vegan stuffed peppers were born, and everyone loved them. Preheat oven to 350 degrees and remove stems and seeds from peppers by cutting around the top of the stem. Set aside. Heat 1 tbsp olive oil in pan at medium heat and then add garlic and onion and dried basil. Saute until onions soften. Add mushrooms, zucchini, tomato, seitan and kale. Saute for about 7 minutes and then add in rice and tomato paste and salt and pepper to taste, as well as jalapeño if using. Reduce heat to low and toss so rice is well seasoned. Stuff the mixture into the peppers until full and place peppers in a casserole dish standing upright. Bake for 15-20 minutes or until peppers are softened. Remove from oven and let cool for a few minutes before eating. These were very tasty and simple and the seitan pleased the omnivores in my family. You could easily switch out the filling for whatever veggies you have on hand but I highly recommend keeping the mushrooms! They also make great leftovers for an easy lunch the next day! 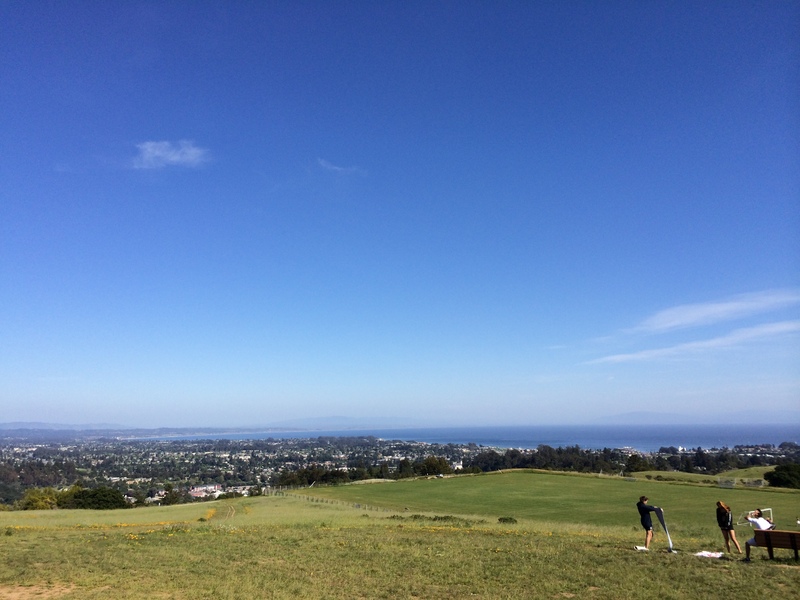 I’m not sure what the weather is like where all of you are, but here in Santa Cruz it’s really warming up. I usually get back to my apartment after class sweaty from the walk. The weather is bouncing back and forth, cloudy and windy 60 degree weather one day and hot 88 degree weather the next. (global warming!) So my meals have definitely been switching towards cooler foods like smoothies, salads, lots of fruit, and fresh juices. 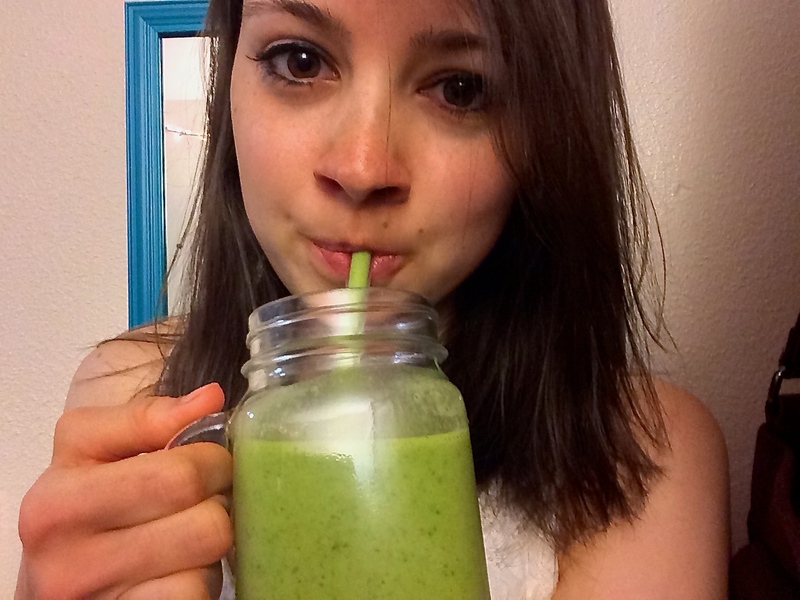 One of my favorite smoothies lately has been my “Green” Vegan Reese’s Smoothie. Chocolate, peanut butter, and a dose of greens? I’m sold! Blend everything well and enjoy! It’s a super delicious snack or light breakfast and definitely cures my chocolate peanut butter cravings in a healthy way. My other go to warm weather food is grain salads! It’s a yummy, filling, light meal with endless variations. My favorite traditional grain based salad is Tabbouleh, typically made with bulgur, parsley, tomatoes, and lemon and olive oil. However I also love making it with couscous! 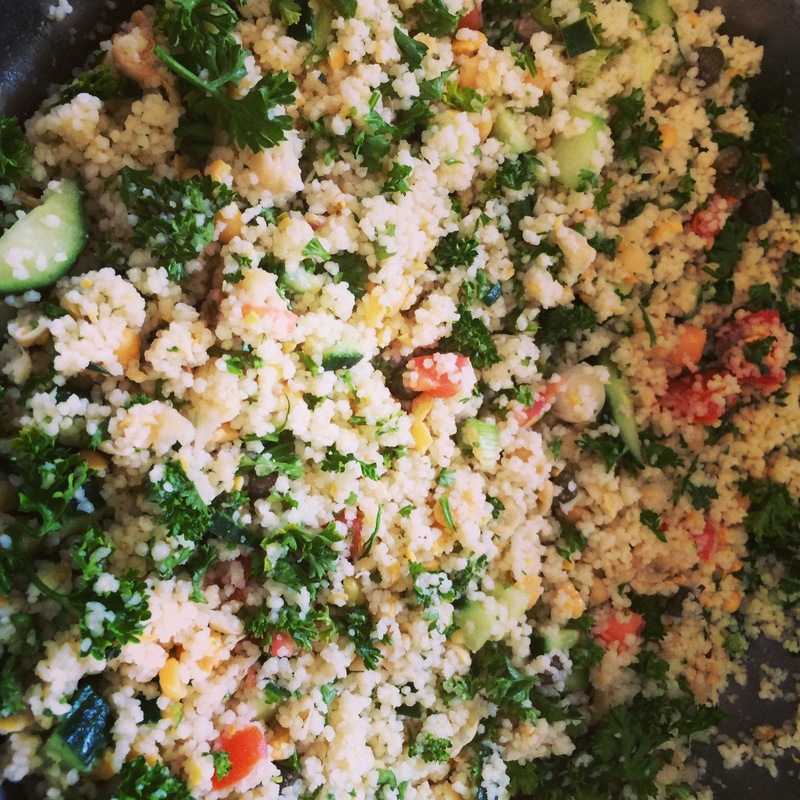 I was inspired by Isa Does It’s Tabbouleh of the Sea I made for Easter and have been adapting it and switching it up in the past few weeks. I also love her handy cooking tip for couscous! You simply bring the water to a boil. Pour in your couscous and remove from heat. Let the pot sit covered for 10-15 minutes and Tada! Perfectly fluffy couscous that doesn’t require being cooked on the stove. Toss all ingredients, seasoning with salt and pepper to taste. Chill salad and enjoy! Makes about 4 servings. It’s so good and fresh. It also makes an excellent packed lunch to take throughout the week. I’ve definitely been taking advantage of the summer weather lately. Sitting in the sun, reading for my classes, and walking to classes. The sunshine makes everything more enjoyable. 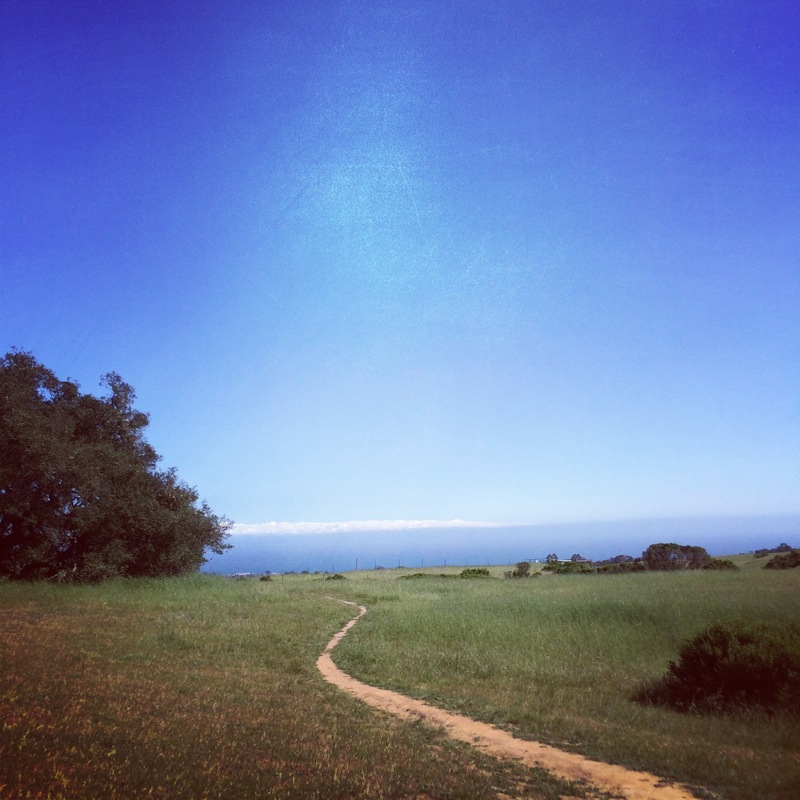 Hopefully your all getting out there and taking advantage of the great weather too! 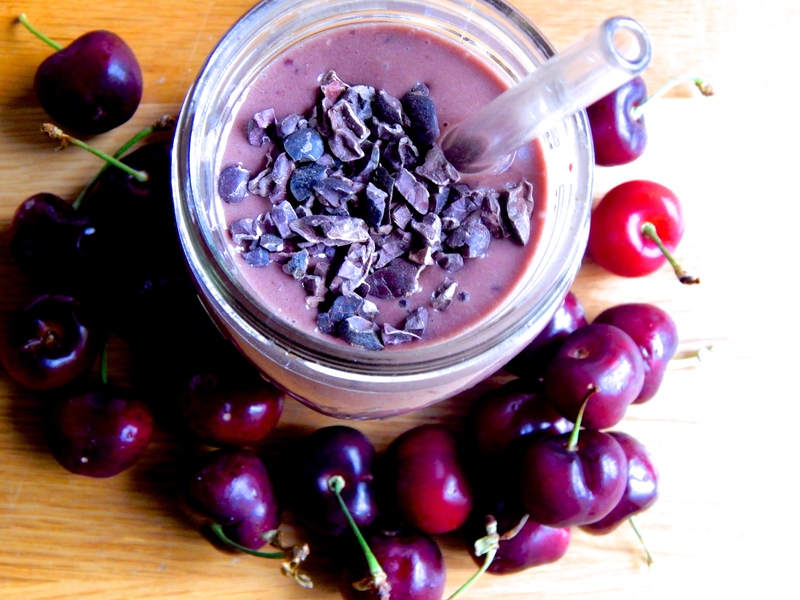 This entry was posted in Recipes and tagged plant based, Recipes, smoothies, vegan.